Version 2 of Camera+ 2 is a major upgrade where the main focus has been the camera system itself. Your new camera is cleaner, clearer and more powerful than ever before! The camera section of Camera+ 2 is, naturally, one of the most important areas in the app. Our goal for the past few years has always been the same: to provide the highest-quality camera we possibly can, and making it so that both novices and advanced photographers can easily find the tools and features they need. Achieving this goal demands a delicate balance between simplicity -so the user interface is clean, welcoming and never overwhelming- and discoverability, to allow power users to find features like manual controls if and when they need them. In fact, we believe that this approach has helped many of our customers find out about new photography techniques as their interests progressed towards more ambitious goals. The new camera still shares the same goals, but a lot has changed since the first iPhones were introduced. Every new model has brought significant improvements to the camera hardware, and we have always added the features that help our customers the most. Technically complex features like Action Mode, Slow Shutter or Macro need to act on several camera settings at once. Other “classic” features, such as the stabilizer or the timer, are simply helper tools to assist you while shooting. Sometimes this distinction was not clear enough, and that could cause confusion in certain situations. For example, both Slow Shutter and Timer were tools that used to belong to the same “shooting modes” bag – those things you disclose with the (+) icon next to the shutter button. That meant it was not possible to select both at the same time, and yet it is perfectly reasonable to use a timer while in slow shutter mode to prevent motion blur caused by camera shake. Our new design solves these limitations by grouping together related items into three distinct categories: Presets, Shutter types, and Settings. Presets are a global configuration of the camera to achieve a particular technique. The Action Mode Preset, for example, combines a fast shutter speed with subject tracking and burst shooting. Other Presets include Slow Shutter or Macro. Presets define what you want to do, while Shutters (or shutter types) define how you want to shoot. Burst, Timer, Stabilizer and Smile are examples of Shutters. Settings, on the other hand, are just preferences about your camera, like the option to show the grid or the horizon level. Presets, Shutters and Settings can be selected independently from each other. A couple of combinations are not possible due to technical limitations, but most are possible. When an incompatible option cannot be selected, we’ll explain you why. An additional advantage of promoting Presets to their own group is that there is now a button dedicated to this new category. 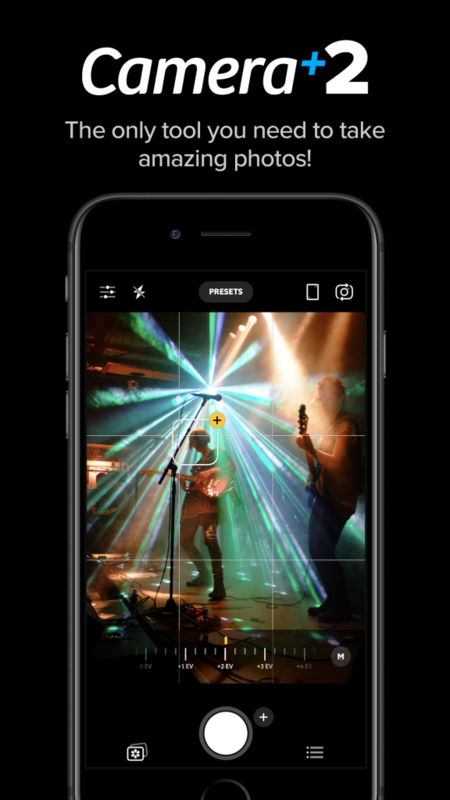 We believe this will help users discover features that may be useful to them without having to master photography parameters like manually setting the desired exposure. For those photographers that do want to adjust the exposure of their photos, we have provided a natural, progressive disclosure mechanism. When you tap on the viewfinder, the exposure compensation dial (or EV wheel) will be displayed. This allows you to make the image brighter or darker with respect to the exposure we think is best for the scene you are looking at. This is the simplest form of manually controlling the exposure. If you want to go further, tap the exposure button and then the EV wheel will mutate to a shutter speed wheel, allowing you to be explicit on the speed you want to use. In this mode, we will calculate and set the ISO for you. To go full-manual, tap the ISO button to disclose an ISO wheel that you can manipulate as you wish. Camera+ 2 will remember your last-used settings, and will use the same ones the next time you open the app. Nevertheless, if you are sure you always want to use manual controls, you can configure them to be always visible through the settings menu. 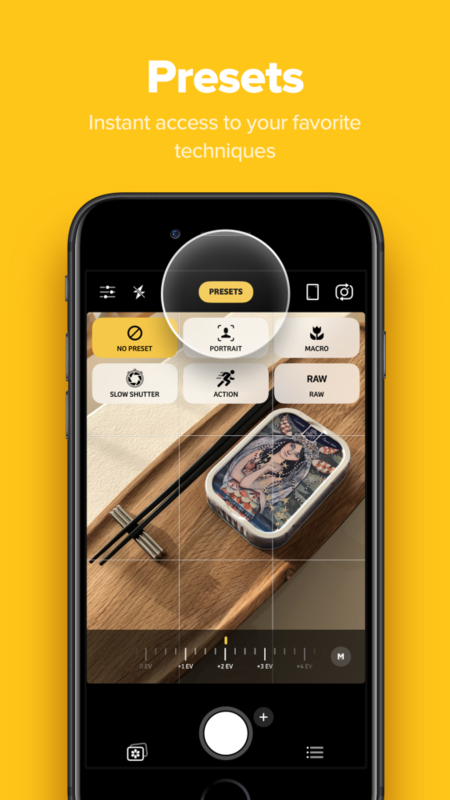 We believe the new camera in Camera+ 2 will provide a delightful experience, and it’s also a solid foundation that will allow us to easily incorporate new features in the future. We have also worked on stability and memory consumption, so the app should always feel fluid and responsive. If you do experience a bug or have any comments whatsoever, please contact us and we’ll be happy to help.